The single-stranded fragment pairs with the bacterial chromosome and recombination takes place. The remainder of the single-stranded DNA fragment is degraded. .one of the resulting cells is transformed and the other is not. 8.20 Genes can be transferred between bacteria through transformation. in order to introduce particular DNA fragments into cells. They have developed strains of bacteria that are more competent than wild-type cells. Treatment with calcium chloride, heat shock, or an electrical field makes bacterial membranes more porous and permeable to DNA, and the efficiency of transformation can also be increased by using high concentrations of DNA. These techniques make it possible to transform bacteria such as E. coli, which are not naturally competent. 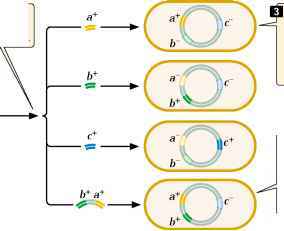 Transformation, like conjugation, is used to map bacterial genes, especially in those species that do not undergo conjugation or transduction (see Figure 8.9a and c). Transformation mapping requires two strains of bacteria that differ in several genetic traits; for example, the recipient strain might be b~ c~ (auxotrophic for three nutrients), with the donor cell being prototrophic with alleles a+ b+ c+. DNA from the donor strain is isolated and purified. The recipient strain is treated to increase competency, and DNA from the donor strain is added to the medium. Fragments of the donor DNA enter the recipient cells and undergo recombination with homologous DNA sequences on the bacterial chromosome. 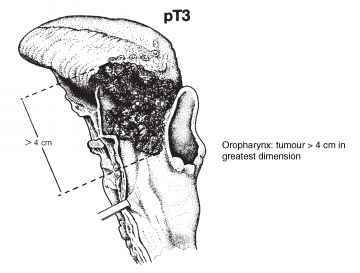 Cells that receive genetic material through transformation are called transformants. Transformants ffl DNA from a donor cell is fragmented. Fragments may contain one or more genes of interest. Donor cell ffl DNA from a donor cell is fragmented. Fragments may contain one or more genes of interest. After entering into the cell, the donor DNA becomes incorporated into the bacterial chromosome through crossing over. ^ Genes that are close to one another on the chromosome are more likely to be present on the same DNA fragment and be recombined together. I B.21 Transformation can be used to map bacterial genes. incorporated into the bacterial chromosome through recombination. If two genes are close together on the same fragment, any two crossovers are likely to occur on either side of the two genes, allowing both to become part of the recipient chromosome. If the two genes are far apart, there may be one crossover between them, allowing one gene but not the other to recombine with the bacterial chromosome. Thus, two genes are more likely to be transferred together when they are close together on the chromosome, and genes located far apart are rarely cotransformed. 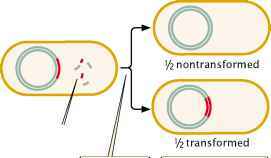 Therefore, the frequency of cotransformation can be used to map bacterial genes. If genes a and b are frequently cotransformed, and genes b and c are frequently cotransformed, but genes a and c are rarely cotransformed, then gene b must be between a and c — the gene order is a b c.